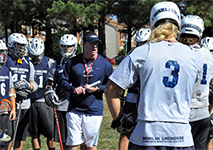 Our Virginia lacrosse camps are available year round. We run summer camps until fall ball starts and once it gets cold we head indoors for some intense stick work during our winter indoor leagues and box clinic. Expect some great things for all skill levels and most importantly you can expect to have some fun. You'll find out all the details of each camp below including age requirements and costs. Remember that we'll be giving away lots free swag and t-shirts during our camps so go on get yourself booked up! Each day begins at 9AM & concludes at 3PM. Campers are divided into age groups, & instruction is based on campers age & ability level – ALL ABILITY LEVELS FROM BEGINNING TO ADVANCED ARE WELCOME & ENCOURAGED. Each day includes both individual & team instruction, & games are played each afternoon. To beat the summertime heat we’ll also play indoor games each day! Lunch is provided on Thursday, & each camper receives a Marlin Lacrosse Camp tee-shirt. June 17 - 20 • 9AM-3PM. Copy this event to your Google calendar. Equipment is available to borrow. July 15-18 • 9AM-3PM. Copy this event to your Google calendar. Marlin Lacrosse Camps & 757 Select Lacrosse (www.757selectlacrosse.com) have joined forces again for the 2018-2019 Winter Indoor League. Campers are divided into age groups (u9, u11, u13, u15) so that everyone plays with boys in his own age group. Instruction is provided by NCAA coaches & players; all instruction is based on campers age & ability level. Indoor lacrosse is a great way to improve your stick skills for the spring in a fun environment. Each day includes instruction & games. All campers receive a Marlin Lacrosse Camp jersey. The off-season is the best time to improve your game. Our Winter Indoor League is a proven, fantastic opportunity to improve your skills. We combine instruction with playing time. Each age group receives 2 instructional sessions each day. Our instructionals are taught by NCAA coaches & our emphasis focuses on the nuances of the indoor game - a proven method in developing players for the spring season. 12/1/18, 12/8/18, 12/15/18, 12/22/18 & 1/5/19. 9:30AM – 11AM for U9 & U11. 11AM – 12:30PM for U13 & U15. All equipment must be provided by the player. Short sticks are mandatory for all players except the goalies. All games are indoors on rubber floor – sneakers are required. Each player must pre-register and pay a $165 fee to reserve their spot in the league. All registrants will receive a confirmation email upon online registration. Check in will be held on Saturday 12/1 prior to your time slot (9:30AM – 11AM for U9 & U11 / 11AM – 12:30PM for U13 & U15). Virginia Wesleyan's Men's Lacrosse program has achieved many great accomplishments over the past few seasons & has consistently competed within the Old Dominion Athletic Conference & NCAA Division III as an elite program. Marlin Lacrosse players have been recognized with numerous awards, & have continued their lacrosse playing careers at the professional ranks. Our Marlin Lacrosse Prospect Day will be a full day simulating Marlin Lacrosse from a simulated NCAA practice with Virginia Wesleyan University coaches to games where the Marlin coaches will be able to evaluate the players. The Prospect Day is for High-School players only (grades 9-12) who are interested in being recruited by Virginia Wesleyan. In addition to the practice & games, the prospects will attend an informational session on VWU Admissions, have a campus tour, eat in the campus Dining Center, & sit down with the coaches to discuss the recruiting opportunities at Virginia Wesleyan University. Space is limited so enroll now to reserve your spot, & come attend a great day of lacrosse where you can compete with other elite recruits! Each player must pre-register and pay a $105 fee to reserve their spot. All registrants will receive a confirmation email upon online registration.